The Israeli rhythmic gymnastics team ended its Olympic bid with a stellar accomplishment for Israeli sports Sunday, ranking sixth in the 2008 Beijing Games' team event – the first rhythmic gymnastics team final Israel has ever made it to. The judges awarded Katerina Pisetsky, Alona Dvornichenko, Raheli Vigdorchik, Veronika Vitenberg and Maria Savenkov a total of 32.100 points, after an exhilarating performance with three hoops and two batons. Saturday's competition saw the five's teammate, Ire Risenson, make a little bit of history as she became the first-ever Israeli gymnast to qualify to the rhythmic gymnastics individuals' finals. The 20-year-old ranked 9th overall. Russia's rhythmic gymnastics team won Olympic gold with the Chinese taking silver and Belarus claiming bronze. In Track and Field, Israeli long-distance marathon runner, Haile Setain, ended his Olympic bid in 69th place, finishing the 26.2-mile race with a time of 2:30:07h. Kenya's Samuel Wanjiru took the marathon gold, Morocco's Jaouad Gharib took the silver and Tsegay Kebede from Ethiopia claimed the bronze. 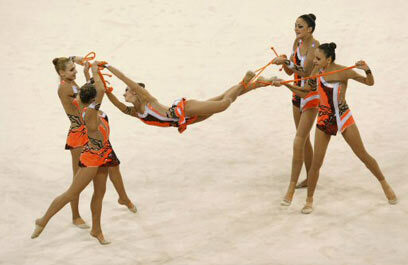 See all talkbacks "Rhythmic gymnastics team ranks 6th"